Bucks County Playhouse gift certificates are available year-round and are a wonderful gift idea for any occasion! NEW! 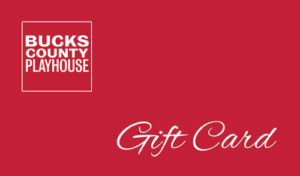 You can purchase three different types of Bucks County Playhouse Gift Cards! Email Cards: Have your gift card emailed to anyone, anywhere via email! Text Cards: Have your gift card sent via text message to any mobile phone! Traditional Gift Card: Select a traditional credit card sized gift card! Gift cards must be redeemed via phone or in person. They currently cannot be redeemed online. Please note: If you have a previous gift card balance, it has been transferred to our new system. Please call the Box Office for details. Or call the Box Office at 215.862.2121!